Russia helped Ukraine in difficult times, Ukrainian Prime Minister Mykola Azarov has said. "The word 'blackmail' has a certain meaning in international politics, and when they help you in difficult times it is not called 'blackmail.' Russia was trying to defend its interests," he said on the Shuster Live show on the Inter television channel late on Friday. 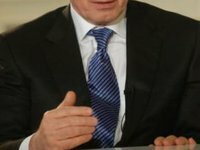 When asked whether the fact that Russia first blackmailed Ukraine and then allocated money is a threat to the country's sovereignty, Azarov said that the agreements reached with Russia, quite the contrary, are strengthening Ukraine's sovereignty. He also said that global financial markets had reacted positively to the agreements signed by Kyiv and Moscow, increasing Ukraine's investment attractiveness.